Despite me being quite cross at the time Joel went out last week and bought a new car. Having had ours fixed and finding out it had been in a really bad accident before that the previous owner didnt tell us AND which didn’t show up on the search we shall probably not be going near any independent sellers again – why can you just not trust people!? So Joel took at out last Saturday and swapped it with quite a few pennies for a Honda CR-V… yes a 4×4 to cope with the snow that began the very next day. Seems a bit frivolous but Joel did his research to find the most economic and fact is we live right on the edge of Sheffield, exposed to the elements and everywhere is a hill. The minute snow arrives we are stuck in. Turns out it was a good time to get it as on Tuesday Beth and I left for Luton and very nearly didn’t get home the following night. Sheffield was totally covered… well covered and up to knee high in snow. The drive between Nottingham and my door was the scariest drive I have ever had to do and I would have just abandoned the Focus right at the start of that section. It was crazy seeing so many cars abandoned on motorway roundabouts. Anyway it made it a possible for us to make an important decision late Thursday night about whether we could dig the car out again and make it to Ipswich for a very important time with the family. And our brill new car got us there. Joshua, our new little nephew had been born poorly. Right the way through the pregnancy they had been monitoring his heart and were worried he might not make it. He did make it and after a few operations at birth he was doing brilliantly and looking strong and healthy, and extremely beautiful… and a very cherished special part of the family. 2 weeks ago today we got a message to say that Joshua’s heart had suddenly stopped and they were at the hospital trying to revive him. He had actually just been taken in because his mum and dad were a little concerned about his feeding. They were weening him and he’d been eating well but seemed a little off his milk. Grandma and Granddad were staying and so took the other 3 boys off to the seaside leaving his mum and dad to both go together to have him checked up. All seemed fine and there were no problems but all of a sudden as they were taking him out of the room he started to make a noise he hadn’t made before and was quickly taken for more checks. As he lay on the drs table he squeezed his mums hand and his little 5 month old heart stopped. They tried for a long time but couldn’t revive him and all we can do is trust that God chose the right time to take him. His mum and dad were both there, they were at the hospital already when panic set in so they know they got help for him instantly, but for some reason his body just didn’t want to go on. I can’t even imagine what that moment would have been like for them. I don’t think there can be anything worse. 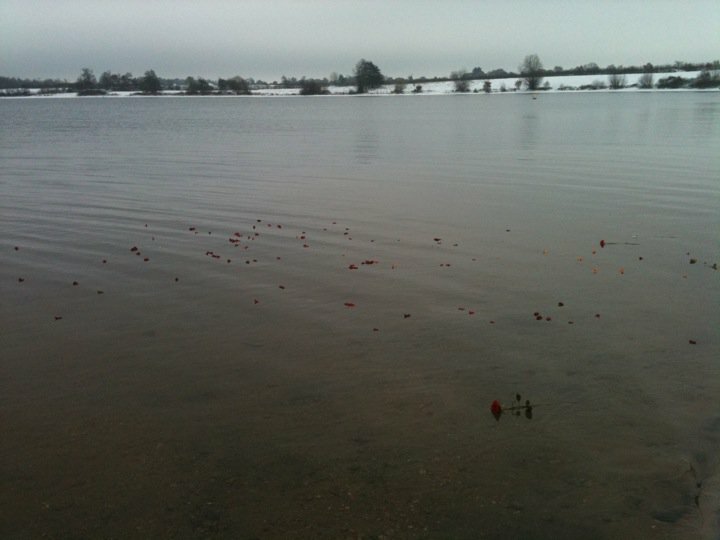 So we are so glad that, despite the snow almost stopping us, we were able to stand, in the snow, at the side of the lake he loved to be walked down to and share in the memorial with our precious family…but are so very sad that he’s not here.